Located on the Riverwalk, La Gloria sits just north of downtown in the revitalized area of the Pearl Brewery. The relatively small restaurant is decorated with bright colors and a clash of urban and traditional Mexican-inspired artwork, serving as a visual for the food they serve. At night, La Gloria is alive with lights along its patio dining area and a loud buzz of conversation, which is sometimes accompanied by live music (usually guitarists). The atmosphere makes it feel more like a party than a restaurant. Trendy with a vibrant atmosphere, La Gloria is not the place to go for a quick bite to eat. The wait to be seated during the lunch and dinner rush is usually about an hour. Customers can kill time by visiting the bar, which has an extensive drink selection, and by taking a stroll along the Riverwalk. La Gloria was founded by highly acclaimed Chef Johnny Hernandez, a graduate from the Culinary Institute of America in New York and founder of True Flavors Culinary Concepts, a noteworthy catering company in San Antonio. La Gloria specializes in traditional Mexican street food with a modern twist. La Gloria is definitely for those who want to shake things up and try a new interpretation of Mexican cuisine. La Gloria serves food tapas-style, meaning smaller plates and servings. Customers can order numerous menu items and try a bit of everything from the vast menu — which can be extremely overwhelming at first glance. Even with the helpful glossary accompanying the menu to help translate dish names, the decision can still be challenging. Thankfully, the staff is knowledgeable about everything on the menu and attentive to all customers, even during crazy rush hours. More than 10 options of tacos are on the menu, ranging from basic Bistec (beef tacos) and Pescado Baja Califas (fish tacos) to unique and innovative dishes like Tacos Potosinos, rolled corn tortillas in chile sauce topped with a generous amount of cheese with pan fried potatoes and carrots and the Al Pastor, roasted pork served with pineapple, onions and cilantro. The ceviches are a popular dish: Ceviche Verde with marinated fish, avocado, tomatoes, onions and olives or Ceviche Estilo Nayarit with marinated shrimp, cucumber, onions and peppers. One can also never go wrong with the Panuchos, an open-style gordita topped with black beans and various toppings. 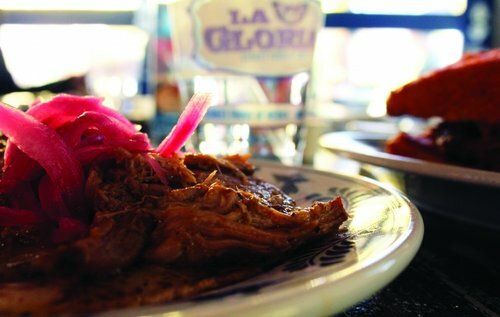 The most popular Panucho is the Cochinita Pibil, roasted pork with achiotes and chiles. For groups of three or more, the best food experience at La Gloria is the Molcajete, different meats or cheese in chile sauce served in the traditional Mexican mortar along with corn tortillas. The dish serves an average of four to five people. A Molcajete favorite is the Arrachera en Adobo, beef steak in pasilla sauce with onions and a heaping amount of cheese. The menu has one sour spot, though: the Tlayudas, referred to as a “Mexican Pizza,” which is really nothing but a glorified giant chalupa with black beans, shredded cheese, beef, avocado, lettuce and tomatoes. The desserts get mixed reviews as well. The Tres Leches is not moist but is still delicious. The Flan, however, tastes exactly like cheesecake. Its taste is adequate, but it doesn’t really taste like flan. While La Gloria prides itself in bringing the traditional into modern light, the desserts did not reach that goal. A big downfall to La Gloria is the price. Prices are not fit for the college budget. Since everything is sold a la carte, it’s more expensive than a student would want. If you’re on a budget, order the set of three tacos, which starts at $5.25. The Panucho is on the smaller side, yet still satisfies, at $4.50. Another filling pick is the tostada, which starts at $3.75 and is essentially a smaller version of the Hayuda (“Mexican pizza”), which starts at $7.50. Considering the small amount served, the ceviche is also on the pricier side starting at $8. La Gloria is better suited for casual snacking and drinking on special occasions and is not the place to go for a sit-down meal. As well, one of the most negative aspects of La Gloria would be the lack of complimentary chips and salsa for their customers — a staple of any Mexican restaurant. La Gloria is more convenient for a night out with a small group of friends or a simple date night with someone special. Despite the price, La Gloria is still worth the trip downtown for a great experience. La Gloria offers unique food and a fun atmosphere that promotes good times, making for an unforgettable dining experience. La Gloria is open Sunday-Thursday from 11:00 a.m.-10:00 p.m. and Friday and Saturday from 11:00 a.m.-midnight. For more menu information, visit www.chefjohnnyhernandez.com/lagloria.